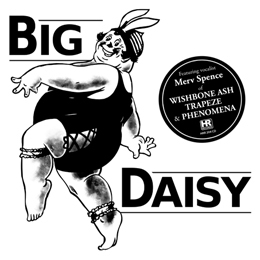 Big Daisy, formed in Lichfield in early 1978, is a very good example for a more or less prototypical Now Wave Of British Heavy Metal band. The band came with a 7” single and played locally a few shows and then disbanded after a few years. Nowadays, their superb single “Footprints On The Water”, issued on the collectible Ellie Jay label in an iconic picture sleeve in 1980, rates as one of the top rarities. Merv Spence (vocals) never left the music business and worked over the years with bands as Trapeze and Wishbone Ash. Back in the days reviewers have compared Big Daisy’s style to Rush. The band recorded a few demo’s. And now the High Roller Records label has released these tracks on a full cd. I must say, this is a “must-have” record for every fan of heavy metal and for sure for the Rush-fans! I’m sold for this one! Let the search begin for the vinyl-version!